So another evening of fun-filled T20 Blast cricket comes to an end. And it's Worcestershire who can take the West Midlands' bragging rights home down the M5 motorway. We'll be back tomorrow from 10:55 BST with live text updates as four matches get under way in the County Championship. The T20 Blast live text returns next Friday. Until the morning, goodbye! Ben Raine starred with the bat and ball for Leicestershire at Headingley, hitting a career-best 48 before claiming a career-best 3-7 as Yorkshire crumbled. The Vikings top-order collapsed and the hosts never looked in the match with Raine and Kevin O'Brien (3-27) doing the damage. Niall O'Brien (39 off 21 balls) and Lewis Hill (24* off 10 balls) hit some late boundaries as The Foxes had posted a par 174-7. Brett D'Oliveira's fine 62 off 38 balls led Worcestershire to a comfortable five-wicket victory over rivals Birmingham Bears at Edgbaston. Chasing 156 to win, the Rapids fell to 45-3, but D'Oliveira along with Alexei Kervezee (40) and Ross Whiteley (23) saw them home. Earlier, Bears skipper Ian Bell hit 66 as the hosts made 155-8. Richard Levi again provided the top-order spark for Northants as the 2013 T20 Blast winners made it two victories from two to start this summer's competition. Wes Durston (47) and Chesney Hughes shared 74 for Derbyshire, and Tom Poynton's unbeaten 37 off 21 balls saw them post a tough target for the hosts. Levi, however, struck four sixes in his 58 from 37 deliveries and Josh Cobb (35) and Steven Crook (33 not out) helped see them home with one ball remaining, despite Andy Carter's 3-34. Martin Guptill lived up to his star billing with 72 off 46 balls, but lacked support from his new Lancashire team-mates as Durham breezed to an easy win at Old Trafford. Lancashire's innings fell away after the New Zealand opener fell to Barry McCarthy (3-23) in the 13th over and Durham effectively ended the game as a contest by scoring 73 from the powerplay at the start of their reply. Phil Mustard made 46 off 25 balls, passing 3,000 T20 runs in the process, before Graham Clark (36) and Michael Richardson (34 not out) saw them home with 30 balls to spare. 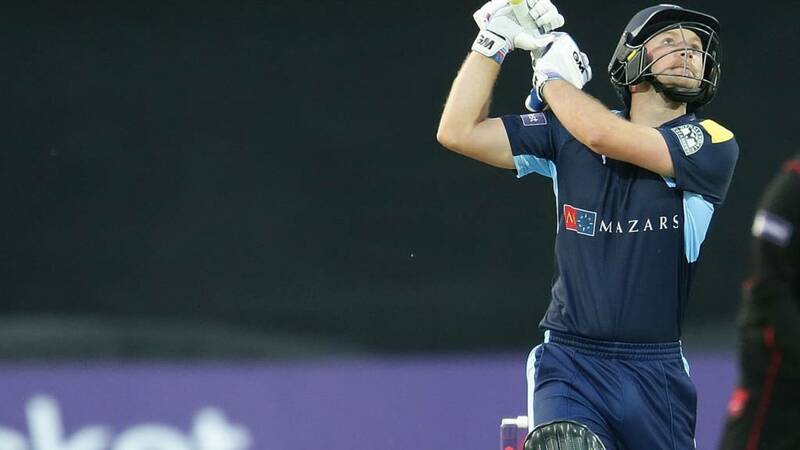 Middlesex's new T20 skipper Dawid Malan led from the front with 93 off 48 balls as they saw off Hampshire by a comfortable 69-run margin at Uxbridge. Malan hit five sixes and 10 fours before falling to Gareth Andrew, who took 2-19 for the visitors, but Hampshire began their run-chase by scoring 55 inside the first six overs. Adam Wheater made a quickfire 30, but Shahid Afridi was run out by James Fuller for eight as they lost six wickets for 22 runs, and despite Liam Dawson's 46, they were all out at the start of the 16th over. "Brett D'Oliveira is frightening at the minute. He's played fantastically well in red-ball cricket, he shone today with the bat. "He's a good all-round cricketer and probably our best fielder as well, so he's got a lot going for him." "I think Worcestershire played very well. We'll move on, it won't knock us too much and we'll move onto the next game next Friday. "We're not going to rip up anything and change everything, we're a good side in this tournament. We've been knocked today but we'll dust ourselves off." "It was disappointing we never really got that partnership going in the middle which would have been nice to kick on and post a good score. I think we were 20 runs short. "We didn't cash in in that middle period where we could have got a partnership going and gone big at the end." A completely one-sided affair is brought to an end by the brilliant Ben Raine, who bowls Ben Coad for one. The Leicestershire bowler finished with 3-7 from just 3.4 overs as Yorkshire are bowled out for just 120. It never looked like a contest in all honesty and the Vikings have plenty to think about before the second match. Youngsters Ben Coad and James Wainman keep out Clink McKay, as nine runs comes off the over. Leciestershire have bowled exceptionally well under the floodlights at Headingley and are cruising towards victory. What a way to finish it! Brett D'Oliveira launches Oliver Hannon-Dalby back over his head for a maximum to seal Worcestershire's victory over their local rivals. D'Oliveira finishes on 62 from 38 balls. It really was one of the finest, most composed knocks you will see from one of the country's form batsmen. Birmingham Bears were thoroughly outplayed. It doesn't really matter but that's a bit embarrassing for poor Mark Adair. Brett D'Oliveira skies one to backward point and the youngster spills it. Next ball though Ross Whiteley's stumps are sent flying by Recordo Gordon. The equation is still simple, only one needed off the last over. Will Rhodes excellent innings comes to and end as he is caught at long-off by Tom Well off Neil Dexter, who finishes with 2-26. The Vikings need another 65 runs from 18 balls to win or more accurately the Foxes need one more wicket. That's the equation for Worcestershire Rapids after Ross Whiteley smites Oliver Hannon-Dalby back over his head for a sweet six. One blow will do it. Recordo Gordon bowls two wides in a 17th over which goes for just seven, but Worcestershire don't need to look for the boundaries now. 16 needed off the last three overs. Andy Hodd lasts all of three balls as Kevin O'Brien picks up his third wicket of the innings. It's been a disastrous batting performance by the hosts. Neil Dexter picks up his first wicket of the match as Liam Plunkett goes for a second-ball duck. The run-rate skies past 15 and the pressure is all on Will Rhodes' shoulders, who is 38 off 20 balls. Well batted Brett D'Oliveira. The Worcestershire batsman brings up his half-century off 30 balls with four fours and two sixes. Can he finish off the game for his side? Brett D'Oliveira is seeing his side home here with some absolutely brilliant strokeplay. The 24-year-old hits Boyd Rankin for three fours in the over, the first over third-man, the second a fine tickle down the leg side and the third a glorious cover drive. Worcestershire need 23 off 24 balls. A cakewalk.